I’ve just finished my last of five shifts interviewing for ‘The Pack’, the volunteer workforce for the 2015 Rugby World Cup, and I have been hugely impressed by the calibre of the people applying. There are Try Outs being held in each of the host cities with three in London. The process kicked of at Allianz Park, the home of Saracens, and I was in involved in the second phase at Leyton Orient FC where most of those we interviewed were applying to volunteer at the Olympic Stadium in Stratford just a couple of miles away. Back in August 2012 I wrote an article about how the profile of volunteering was at an all time high after the Olympics (click here to read it) and I was delighted that so many of the 2012 Games Makers were amongst those wanting to help at the Rugby World Cup. Given our close proximity to the Olympic Park it shouldn’t have been a surprise that these same volunteers had put themselves forward for 2015 but it was inspiring to hear their stories of what they had achieved over the past two years. The candidates that I interviewed fell into two broad categories; rugby people who had been volunteering at their clubs for several years, and non-rugby people that had volunteered at various local and national events. Of course the ideal candidate was one that had done both. I am used to meeting and hearing stories of long-term volunteers at rugby clubs, people that had been involved first as players then as coaches, referees and administrators over years and decades, rugby people through and through who would help out however they can for their club and the game. But it was talking to the other volunteers during the Try Outs that opened my eyes to the huge amount of work that is done by an unpaid, and until comparatively recently, largely unrecognised army of people. Many had volunteered in one capacity or another before; in the church, with the homeless, in the cubs or brownies, etc., but it was the 2012 Olympics that had set most of them on the road of ‘big-event’ volunteering. Straight after the Olympics they were recruited for the Paralympics and then I heard about a succession of events where they played a part; golf at Wentworth, national youth games, the Anniversary Games, London to Brighton bike ride, international football at Wembley to mention a few, and some were London Ambassadors helping tourists visiting the capital. Most had already been accepted as part of the volunteer team for the English legs of the Tour de France and for the Commonwealth Games in Glasgow. They bring with them a wealth of experience of helping people at major sporting events, experience that will be invaluable at next year’s Rugby World Cup. However, they will be missing one important element; an understanding of rugby people and the ethos of rugby. Many of you reading this article will know instinctively what I am referring to; Rugby is more than a game, more than just 80 minutes of 30 players running about trying to get a ball over some whitewash or between two sticks. The game’s ethos, its Core Values, the camaraderie and friendship are for many of us the reasons we stay involved. The trick will be for the best traits of the rugby and non-rugby volunteers to be combined during the tournament so visitors are greeted with willing and friendly people who already have an affinity with them through membership of the wider rugby family. Having interviewed 20 something prospective volunteers and seen the huge enthusiasm they have for the world’s third biggest sporting event being played on their doorstep, I think that it will be achieved. A word about the organisers of the Try Outs. The team that is running the programme will be spending months on the road as they travel from venue to venue, training volunteer interviewers at each one and supervising 10,000 candidates as they pass through the hour long process. 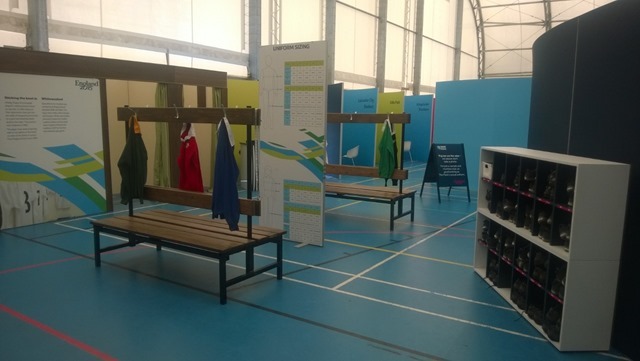 It starts with being checked in before having a look around the exhibition, taking some photographs and trying to pass a rugby ball through a hole. Then a short film which tees them up for the 20 minute interview and their chance to impress, and finally into the changing room to check sizes for the uniform. The staff need to have an incredible amount of patience while they get asked the same questions from thousands of volunteers, and that includes from the interviewers too! 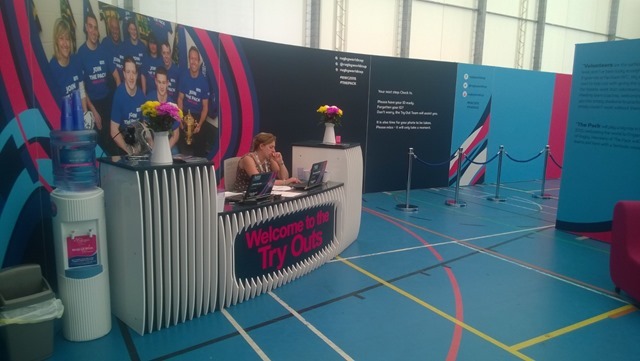 I was interviewing on the first day of the Leyton Try Outs when the 1000th volunteer came through the doors so we are still very much at the beginning of the process. But as the road show moves to Hove for the Brighton Try Outs, the cycle of meeting, greeting, interviewing and fitting starts again, and if they can keep up their levels of enthusiasm until December when it is all over, then they are better people than I! I hope to be available to do some more interviewing at the final Try Outs for Twickenham where thousands have applied to be an RWC volunteer, so I will be able see if they are still smiling. The Olympics’ aim was to inspire a generation to take up sport, but it is clear that it has also inspired the British people to take up volunteering as a worthwhile and rewarding activity. 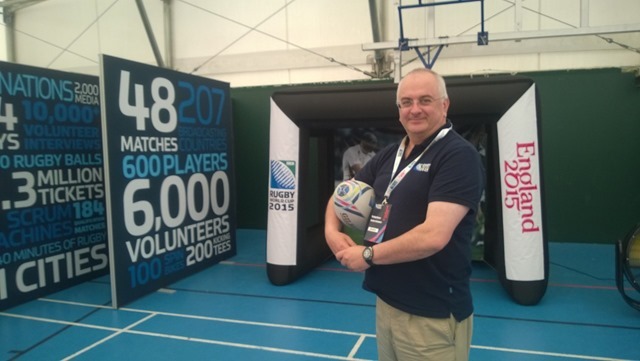 20,000 people applied for the 6,000 available volunteer posts at RWC 2015, so there are potentially 14,000 that will be unsuccessful who have said they want to volunteer in sport. This a massive opportunity for rugby to reach out and invite them be part of our game and to show how enjoyable and fulfilling it is to be part of the rugby family.